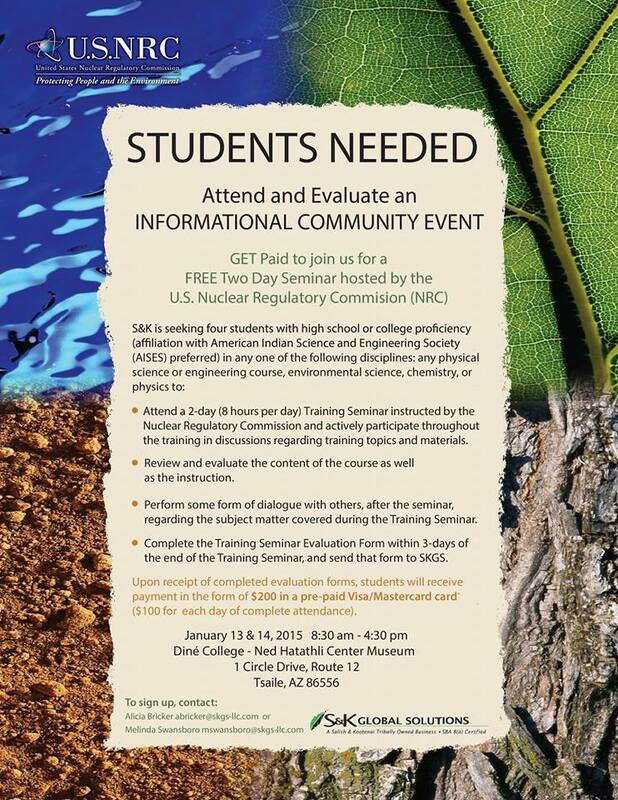 The U.S. Nuclear Regulatory Commission (NRC) invites you to a FREE 2 Day Seminar, Jan. 13 and 14, 2015, on Radiation Effects, Uranium & NRC’s Regulations pertaining to the National Environmental Policy Act at Dine’ College in Tsaile, Ariz., which is on the Navajo Reservation. The NRC is also asking for high school and college students to attend and evaluate the two day seminar. Students will be paid. Students should contact Alicia Bricker, abricker@skgs-lic.com, or Melinda Swansborrow, mswansboro@skgs-lic.com, for information. The NRC also stated that the seminar will answer questions regarding: “WHAT IS RADIATION? WHAT IS RADIATION CONTAMINATION AND HOW IS IT DIFFERENT FROM RADIATION EXPOSURE? The Jan. 13 and 14, 2015, seminar will at the Dine College Ned Hatathli Center Museum, which is located at 1 Circle Drive, Route 12, Tsaile, Ariz., from 8:30 a.m. to 4:30 p.m. daily. For more information, email nrc-training@SKGS-LLC.COM and the NRC is asking for people to register by emailing nrc-training4.eventbrite.com as soon as possible. This entry was posted in Professional Journal and tagged National Environmental Protection Agency, Nuclear Regulatory Commision, radiation, uranium by Marley Shebala. Bookmark the permalink.